Max is co-founder and CRO for breakoutrevenue, where he works with complex solution providers, helping them to accelerate revenue using modern marketing & demand generation technologies and approaches. He works with CMOs advising and applying proven methodologies & predictive analytics to modernize and optimize client demand generation strategies. Content strategy has shifted to a data-driven approach. Because so much data is available about what people are doing on the internet, we can now see what content our target audience is most engaged with. Contrast this with the majority of other predictive analytics solutions today that are attempting primarily to address 'lead scoring'. strategic analysis, what are buyers interested in? Steve: Predicted analytics for content is, yeah, it open door, right? I mean, because if you're a company that doesn’t have a whole lot of leads but you have a whole lot of content or you know, you’ve got enough content to run the algorithm, then it's going to help you get to the next level because you'll be able to have actionable data to create better content that will help you develop more leads, right? [Laughs]And then you'll be able to use the other tools that are out there that require a certain number of leads before you can actually use predictive analytics there, so. Max: Yeah and that's why a lot of these guys like Lattice, just put out their maturity model. That seems to be the theme with predictive vendors; they want you to really identify how mature you are. Are you just getting started? Are you at the point where you’ve got so many leads, you don't know what to do with it? And that sort of helps them tailor their conversation on how to use some of these tools. Steve: What about 6Sense? What can you say about those guys? Max: They're in the same pool as everybody else that's doing lead scoring. Their claim to fame is over the past six to ten years, they’ve developed third party relationships with B2B publishers in certain industries. So a big limitation for all the other vendors is, okay, you’ve got data about people interacting with your content and that's the extent of it, right? Because you don't have a relationship with like Huffington Post or New York Times where they're actually letting you see people interact with their content, what they read on their sites. Steve: Right. It's exciting. It’s just a huge paradigm shift for everybody. Max: [Laughs] I was talking to a friend the other day that had a mobile app that identified stress levels in voices -- stress and aggravation. So [laughs] think about this: a B2B company has people reading on their mobile app, right? Steve: It's amazing. The thing I see is that it's happening very quickly and if you think about the way the market accepted marketing automation software, for instance, companies were slow to accept that. They were slow to get on board. There's always early adapters but there was a huge educational curve that had to take place. Max: You're right. I don't know what's going to happen. What I do know, and in marketing automation we saw a little bit of this too, but it's going to require a different skill set in marketing. And I feel like in the past ten years, marketing has kind of been turned upside down, shaken about and rebuilt as to who you actually need in your marketing department. You know, you need somebody with a process mind in marketing to handle marketing automation that was different from the creative minds that we saw ten years ago. And now are saying, “Wait a minute, stop the process. You can skip over process and predict whatever you want. You just need to know how to handle data and analytics.” So now you’ve got, you know, the traditional IT folks that are now looking into marketing data and analytics and doing the jobs that the process-driven marketing automation marketers of today. Steve: Yeah. I don't think there's any other industry that has experienced so much change. So for the professionals out there providing services and consulting in this area, that is the opportunity. Max: Yeah! Like we saw in marketing automation, it's certainly going to represent a lot of opportunity for third parties consultancies or people that have analytics talent. You'll see like agencies that, instead of having writers and product managers, they'll have analysts. Max: And people that can, you know, evaluate different data solutions. And that's what I see is like the biggest skillset that a company would need in-house; somebody that really understands the potential for using data to make decisions and being able to really ask those questions ahead of time, know what the really valuable questions are given situation their situation, evaluate the vendors and put together a situation where you don't have too many systems in place that don't talk to each other. Integration of data is very important to make predictive work. So, I don't know. I know there's opportunity in there, but some people are going to bring it in-house, some people are going to work with third parties, some people are going to go directly to vendors and it's going to be wild and crazy. And eventually, the market’s going to consolidate and we'll move on to the next thing. Steve: Welcome back to our interview with Max Traylor with breakoutrevenue. So let’s change the subject here real quick. 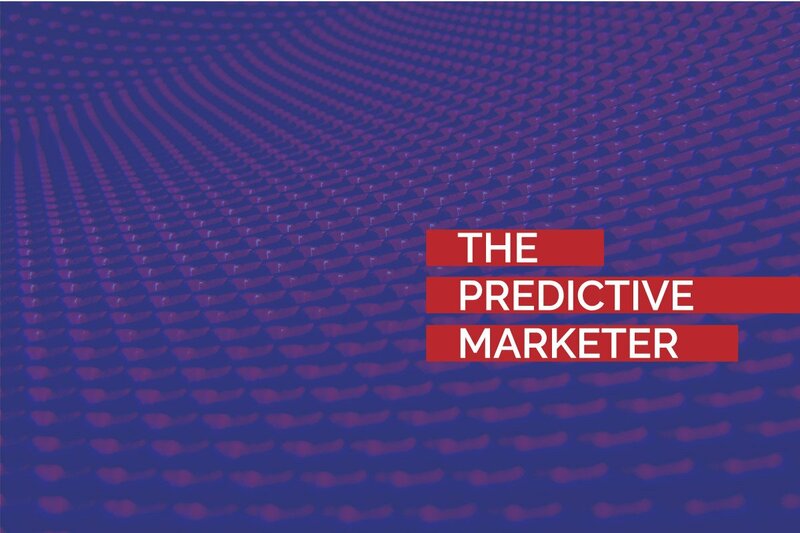 How would you define the different players in the predictive marketing industry? 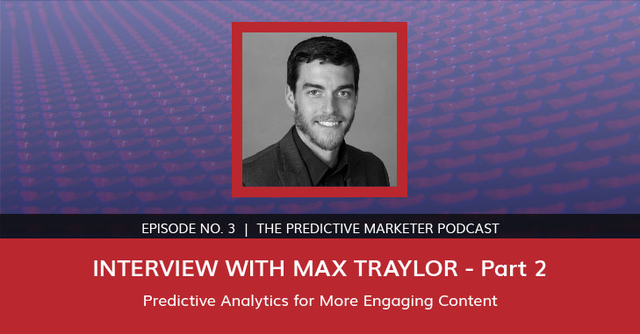 Max: Yeah, check out that Forrester report because it does a good job of identifying the aggregators versus the enrichers and the predictive modelers. But like HubSpot, what HubSpot is doing is becoming a one-stop shop. I mean, they're aggregating data, they're enriching the data with their CRM intelligence results. Steve: Interesting because they’ve got everybody on their server. Steve: But I mean, is there a conflict of interest there somewhere? Max: Yeah, like every direction you look. [Laughs] We've always been asking ourselves you know, what's the conflict of interest between HubSpot and SalesForce but they just keep going at it and somewhere behind the scenes, someone gets a handshake and a pat on the back. Steve: Yeah. I was thinking more along the lines of, you know, they're collecting all the data from all these clients that are their customers. That's what I was thinking. Steve: Yeah, it depends what they're collecting, I guess but anyway, interesting. Max: [Laughs] Yeah, I mean. You know, it's information that I think would otherwise be useless. Max: You know, I clicked on this. I clicked on that. That's not really private information. But in the aggregate, in the whole, it could help somebody go from spending two hundred thousand dollars and wasting seventy percent of it to just get the right information and be a lot more accurate with the things that they're producing. Steve: That makes sense. So what are they going to do with the data? Max: What are they going to do with all the data they're capturing? Steve: Yeah, what is their plan? You know, is it going to be like a feature within the enterprise version that you know, you can gain access to? Max: Yeah, well, it's lead scoring right now, so really what they do is they say, identify the group of leads that you want more of. And you look at your either your customers or your sales-qualified leads and HubSpot will go in and look at everything about those people that they have data on. And the more data, the better. And what machine learning algorithms do is they just throw guesses against the board until they find one that works the best. And then they come back to you and say, “Okay, this is the algorithm that works the best based on your existing customers. And we see that in your database of a hundred thousand leads, you’ve got twenty people that match this algorithm exactly. You've got another hundred and fifty that match at eighty percent.” So it starts to give you a look-alike scenario but first, you have to tell it, you know, what is the group of people you want to analyze and get more of? Steve: Interesting. Okay, so let me ask you another question here while we're on this topic. My clients are all small companies. I mean, they're under the midsize. I’d say they're all under the twenty million threshold. I mean, they're all over the two million threshold but they're under the twenty million. So I don't know if they would be a candidate for an Idio solution, for instance. So that's part of the initial evaluation is how many visits are you getting on a monthly basis and how many people are doing that demo action or that conversion action that you want more of. And then you say, “All right, we'll have the sample size we need in two weeks. And at that time, we'll be able to do anything we want to do because we've got enough data.” But then, you’ve got some enterprise firms that are really nascent in content marketing; haven't done much of anything, not generating any leads. So even though they've got the budget, you might not have the data that you need to really make it work. Max: So it's more about maturity than size. Steve: You know, I mean if we had some kind of analytics, as we've been talking about here, that told us, “Okay, you need to be writing about this. Your target market wants to hear about this,” that would be great because right now, we're just guessing. Max: Yup. We did a pilot with HRmarketer who, they have a social listening tool and their big question is, “Do we target tactical folks that are in the lower end of the totem pole..” and we know that talking about social media and talking about Facebook, LinkedIn, Twitter really resonates with those people and that's how they’ve built up their traffic. But at the same time, the question is, “All right, well, we could also try to attract the higher ops, the CMOs, the digital strategists.” And in that case, we need to be talking about more of the business case topics: lead generation, B2B positioning, that kind of stuff. Steve: Well, the content marketing blueprint was very successful for your previous employer. How many of those did you run through? Like you were there for a couple years doing that, so. Max: Yeah, we had like a hundred HubSpot agencies, a little over a hundred, go through our training of which maybe thirty became like active users that would be blueprinting somebody or multiple companies every week. They really made it a part of their sales process. So it was really fulfilling for me because I really liked working with the agencies and helping them accelerate that learning curve. But it brought everybody to the same place, which was after we do the first three months of content or six month of content or however long it takes you to write about everything you know you should write about, then the question is, “Okay, we've written about it. What do we do now? What do we focus on? Or what do we make the decisions really invest in the webinar series or go to a research organization and drop a couple thousand dollars?” which in most cases, you just don't have the confidence to do because you have to pick one topic. Steve: Right. You guys have a social listening tool that you were using in conjunction with the content marketing blueprint. I remember that. Steve: Did that help you determine what to write about? Max: In a way, yes, because what social listening will do is certainly tell you what's trending in the industry. The downfall of social listening is you can't really tailor it to any one segment of your market. For example, going back to that HRmarketer example, he looks at his tool and he knows that talking about social media is going to get him the most traffic and the most people to his site. But the better question was, “Well, who is that going to attract to my site? Is it going to attract the tactical people that don't have buying power? Or is it going to attract the higher ops that do have the buying power?” And eventually, the answer was ‘no’ but social listening wouldn't tell you that. It would only say that the market, as a whole, is really jazzed up about Tom Brady. Steve: Do you see breakoutrevenue using content marketing blueprint at all? Max: No. You know, I think that what the blueprint did, it was a little bit before HubSpot got a hold of really going into detail as to how to build out their process. And most of what the blueprint did for companies now comes out of the box with HubSpot. You know, you’ve got the opportunity to build personas; you’ve got the opportunity to pick up different workflow formulas. What I would say is that the process that we've put together in the blueprint was sort of a manual process. It was like marketing automation 1.0. It would say that people go through three different stages of the buying cycle. And in stage one, you wanna give them through leadership. Stage two, you give them information about your product. Stage three, you try and get them on the phone. Steve: Awesome. Well, listen, man, I appreciate all your time and insight. This has been great!